Somewhere between a spicy chili pepper and a sweet bell pepper, paprika peppers taste semispicy with a rich deep flavor. Paprika peppers thrive in a long hot growing season and plenty of sun. Start early indoors and move the plants out in the spring. Once dried, first on the vine and then off the vine, this full flavored pepper keeps well in a jar or bag. Some paprika pepper varieties to try: dulce rojo paprika, genuine Hungarian paprika, alma spicy paprika and traditional Hungarian paprika. Start paprika seeds in a protected area seven weeks before spring arrives. Pepper seeds take seven to 14 days to germinate and an additional four to six weeks until they are large enough to move outdoors. Fill peat pots, a seed-starting tray or cell packs with damp seed-starting mix. Use equal parts peat moss and vermiculite to make a sterile medium or purchase a ready-mixed bag at a garden center. Place the paprika pepper seeds on the damp seed-starting 1 inch apart. When using cell packs, plant one seed in each compartment. Cover the seeds with 1/4 inch of damp soil mix. Keep the seeds between 68 and 86 degrees Fahrenheit either in a greenhouse or a protected indoor area that gets filtered sunlight. Place a heating pad under the seed pots to help regulate the soil temperature if the area is prone to temperature fluctuations. Spread a 3-inch layer of manure or compost over the garden area and dig it into the top 8 inches of the garden bed. Prepare the soil in spring when the soil is workable and has begun to dry out. Don't work wet, muddy soil, it will only compact and cause damage. Transplant paprika seedlings outdoors when the soil temperature warms up to 60 degrees Fahrenheit and the seedlings are at least 6 weeks old. Dig holes just large enough for the seedlings' root balls. Make the holes 1 inch deeper than the depth of the root ball. Space multiple planting holes 18 inches apart. Slide the paprika seedlings out of the nursery trays or pots. Handle them by the base of the stem and the roots being careful not to break the tender young stems. Place one seedling in each hole with the base of the stem 1 inch below the soil line. Fill in around each pepper seedling and water to a depth of 5 inches. Fertilize when the plants begin to produce flowers using a 10-10-10 liquid fertilizer. Apply the fertilizer as directed on the package to get the dilution right for the specific brand. Pull grass and other weeds out by hand during the growing season. Paprika peppers have a shallow root system and do not like to compete with weeds. Water twice a week, supplying each plant with 1/4 inch of water each time. Leave paprika peppers to mature and dry slightly on the plant. Depending on the variety, paprika peppers take anywhere from 70 to 85 days to mature for harvest after transplanting outdoors. Pick the fruits when the skins start to harden and wrinkle slightly. Cut each pepper from the plant about 1/2 to inch up the stem. Continue to harvest until the plants stop producing or the first frosts threaten. 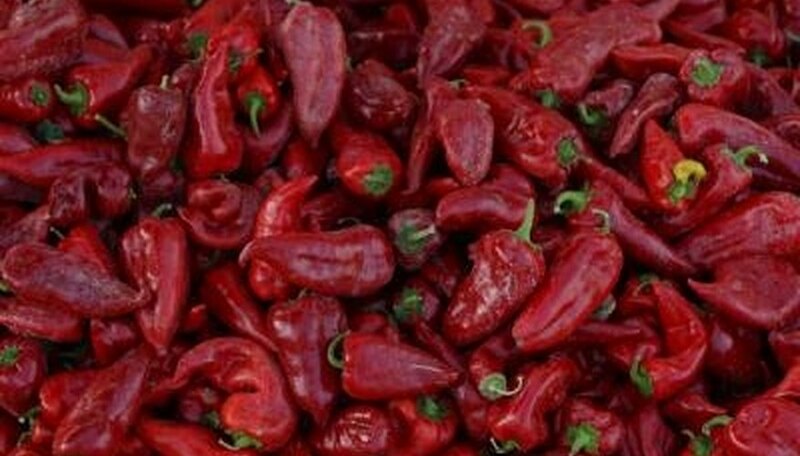 Lay paprika peppers in the sun to dry completely for two to four weeks or remove excess moisture in a food dehydrator. West Virginia University Extension; Growing Peppers; N. Carl Hardin et al.